Today's Draw: Two of Swords from the Victorian Romantic Tarot. Are you on the fence about a decision? Is your indecision driving you batty all throughout the noggin? Is it possible that there's something in the big picture you're failing to see? For today's look at the Two of Swords, I'm going to use the traditional meaning for the card. Or perhaps I should say one of the traditional meanings for the card. Which means I'm also going to include the traditional image so you can see what I'm talking about. Twos in tarot are all about balance and choice. So whatever suit you're in, the twos bring a second thing into the picture that brings balance and a choice. In the cups, it's about meeting your "other half" and choosing love. In pentacles, it's about choosing to balance resources. In wands, it's weighing your options so you can make a balanced decision. And in the swords, it signals two thoughts or ideas, each of which have equal, and sometimes opposing, appeal. This is our REAL image of the week. Somewhere inside you, there's a tie that needs to be broken...a split decision that needs to be resolved. Some consider the blindfold to indicate something you're not seeing. Some consider it an aid in objectivity. Either way, my thought about this version of the card is that all your focus and energy is going into the debate in your head. 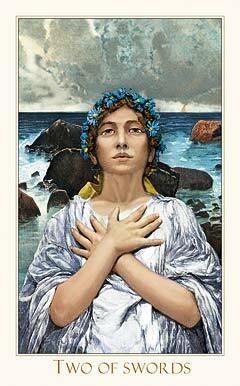 But there is another factor plastered all over the card that you may be missing—your intuition, represented by both the moon and water. Perhaps that's why she wears the blindfold. To see within. 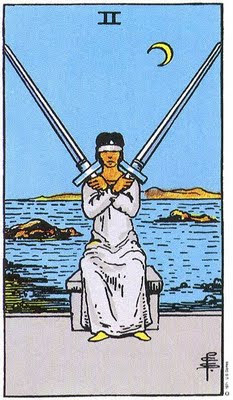 Swords is one of the most difficult suits of the tarot because it deals with all that noise inside our heads. Sometimes we get so caught up in strategy and thought and fairness and weighing things that we forget to consult our inner muse. Where does your intuition want you to go? Where are the tides you pulling you personally? Forget about what you *think*. What do you KNOW? The Two of Swords comes along to reassure us that we have what we need to make the right decision. We just need to make it. But it also tells us that, try as we might to make a decision where everyone wins, swords cut both ways. So if you're holding out for a decision without consequences, you'll be suffering at the edge of life's vast saltwater pond for quite some time. Capice? Two of swords came up for me a few days ago, in a good way. Once the decision was made I was able to move forward, and things just seem so much better since. And for that reason, I'm rather partial to the two of swords right now. :-) Like an honest friend who tells you to, um, (trying to be delicate) do your business or get off the pot!